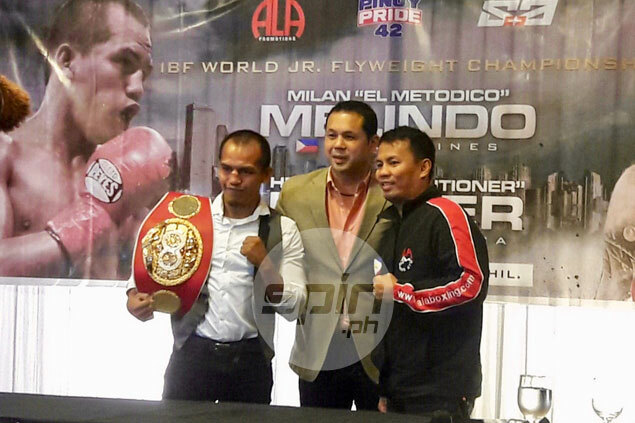 Milan Melindo remained the IBF light-flyweight champ after overcoming adversity and a gritty challenge from Hekkie Budler in a bloody brawl in Cebu. MILAN Melindo came through with a heroic performance worthy of a true champion as he overcame adversity and the gritty stand of Hekkie Budler to retain his International Boxing Federation (IBF) light-flyweight title via a dramatic split decision win Saturday night at the Waterfront Casino and Hotel in Cebu City. His face a bloody mess due to severe cuts he suffered on both eyes, the champion fought with courage and heart in the latter part of the scheduled 12-round bout to turn back the challenge of his South African foe and pull off the inspiring win before a roaring Cebuano crowd. Budler, the former world strawweight champion, won 115-113 in one of the scorecards, but Melindo got the nod of the two other judges, 117-110 and 115-112, to retain the 108-lbs title he won last May over Akira Yaegashi. The fight appeared in the balance entering the final round as Budler came strong starting the sixth round when the champion began to be hampered by a deep cut on his left eye due to an accidental headbutt. But the champ, who appeared to be fading away after another headbutt in the 10th round caused another cut on his right eye, stood his ground and decked the challenger for the only knockdown of the back-and-forth fight. Budler got up at the count of four, and despite in deep trouble, threw caution in the wind and fought Melindo toe-to-toe as the two swung at each other until the final bell. Both of his eyes puffy, Melindo, the pride of ALA boxing stable, raised his record to 37-2 with 13 KOs, while Budler is now 31-3 (10 KOs). Prior to the main event, Albert Pagara and James Onyango fought to a split draw in their 10-round welterweight bout. Pagara sent his Kenyan foe down to the canvass in round five but failed to put away Onyango, who came even stronger in the later rounds to force the draw. The fight ends in scores of 94-94, 94-93 (Onyango), and 95-93 (Pagara).